Oz the Great and Powerful is a 2013 American fantasy adventure film directed by Sam Raimi, produced by Joe Roth, and written by David Lindsay-Abaire and Mitchell Kapner. 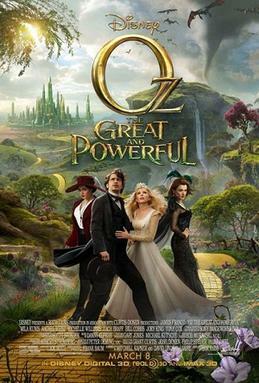 The film stars James Franco as Oscar Diggs, Mila Kunis as Theodora, Rachel Weisz as Evanora, and Michelle Williams as Glinda. The film is based on L. Frank Baum‘s Oz novels, and also pays homage to the 1939 MGM film, The Wizard of Oz. Set 20 years before the events of both sources, Oz the Great and Powerful focuses on Oscar Diggs, who arrives in the Land of Oz and encounters three witches: Theodora, Evanora and Glinda. Oscar is then enlisted to restore order in Oz, while struggling to resolve conflicts with the witches and himself. Oz the Great and Powerful premiered at the El Capitan Theatre on February 14, 2013, and was released theatrically by Walt Disney Pictures on March 8, 2013, through the Disney Digital 3D, RealD 3D and IMAX 3D formats, as well as in conventional theatres. Despite mixed reviews, the film was a box office success, grossing over $454 million worldwide in revenue, $149 million of which was earned during its opening weekend worldwide. It is currently the highest-grossing film of 2013. In Kansas, Oscar Diggs (James Franco) works as a small-time magician in a traveling circus. As a storm approaches the circus, the circus strongman (Tim Holmes) learns Oscar has flirted with his wife and goes to attack him. Oscar escapes in a hot air balloon, but is sucked into a tornado that takes him to the Land of Oz. There the witch Theodora (Mila Kunis) finds him and believes him to be a wizard prophesied to overthrow the Wicked Witch who killed the king of Oz. En route to the Emerald City, Oscar flirts with Theodora, who falls in love with him. They also encounter the flying monkey Finley (Zach Braff), who pledges a life debt to Oscar when the latter saves him from a lion. Upon reaching the Emerald City, Oscar meets Evanora (Rachel Weisz), Theodora’s sister, who is skeptical of Oscar being the foretold wizard. Evanora tells Oscar that the Wicked Witch resides in the Dark Forest and can be killed by destroying her wand, the source of her power. Oscar and Finley are joined en route to the forest by China Girl (Joey King), a young, living china doll whose home and family were destroyed by the Wicked Witch. Oz the Great and Powerful is set in the year 1905, 20 years before the events of the original Wizard of Oz novel and 1939 film. The film also features several artistic allusions and technical parallels to both sources. The film’s opening sequence is presented in black-and-white, transitioning into color when the protagonist arrives in Oz; additionally, the aspect ratio changes from 4:3 Academy ratio to 2.35:1 widescreen, and the audio transitions from monaural to surround sound. As in the 1939 film, Glinda travels in giant bubbles, and the Emerald City is actually emerald; in the novel, characters wear tinted glasses to make it appear so. The iconic green look of the Wicked Witch of the West is closer to her look in the classic film, as the Witch is a short, one-eyed crone in the novel. Additionally, her tears leave scars on her face, reflecting her eventual defeat by water. The Wicked Witches are portrayed as sisters, an idea which originated in the 1939 film. Several actors who play Oz characters make cameos in the Kansas segments. One such character, Annie (Michelle Williams), informs Oscar that she has been proposed to by a John Gale, presumably hinting at Dorothy Gale‘s parental lineage. Other referenced characters include the Scarecrow, who is built by the townspeople as a scare tactic; the Tin Woodman, whose creator is introduced as the Master Tinker; and the Cowardly Lion, who is frightened away by Oscar after attacking Finley. Similarly, various other races of Oz are depicted besides the Munchkins (the only race named in the classic film), including the Winkies, the Quadlings, and the china doll inhabitants of Dainty China Country. Also, Oz is presented as a real place as it is in the novel, and not a dream as the 1939 film presents. Great effects alone make this one worth watching. Almost everyone is familiar with Oz and the idea that the wizard there is just a charlatan with believers. This movie enforces that theme in a somewhat fun way, with awesome visualizations and set work. This is a prequel to The Wizard of Oz. And I liked it. I just don’t like the fact that Franco has the same actors beside him in every movie he does. It was fun and I give it 3.5 stars. Recommended if you are a fan of the original, and/or creepy flying monkeys. Find Oz the Great and Powerful at Amazon.